NHS Quest Senior Improvement Advisor Zoe Egerickx reflects on an energising and inspiring meeting of the Theatre Safety Culture clinical community. 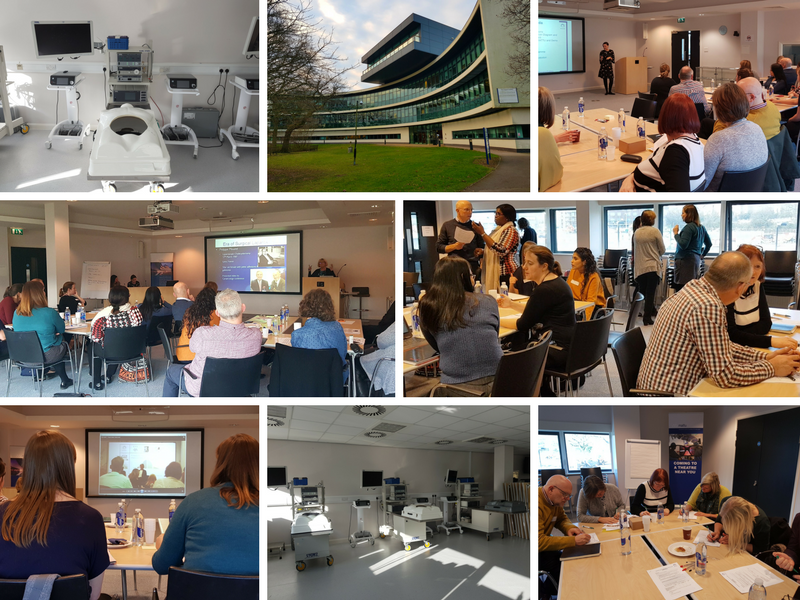 The third meeting of the NHS Quest Improving Theatre Safety Clinical Community took place in an unusual setting on Friday – the MATTU (Minimal Access Therapy Training Unit) at Royal Surrey County Hospital NHS Foundation Trust. When hosted by one of our member organisations, we endeavour to showcase something unique to the Trust that will be of interest to the wider group. On this occasion we had hoped to experience a live video-link into one of the operating theatres on the main hospital site, but an upgrade meant this wasn’t possible. Instead, Alison Snook, a theatre nurse who manages the MATTU gave an enthusiastic and very informative presentation which gave members valuable insight into the history of the MATTU, and how this is contributing to leading innovative developments in laparoscopic surgical techniques internationally. We were given access to their state-of-the-art facilities, but were discouraged from entering the lab where orthopaedic surgeons were learning their trade on cadaveric body parts! Ian Erridge is the Practice Educator for theatres at the Trust and told me he hadn’t visited the MATTU prior to going to see the facilities when he suggested this as a potential venue for the meeting. Ian made quite a discovery – this is another example how the NHS Quest network positively contributes to building relationships within, as well as across, organisations. Being within walking distance of the hospital made it possible for Honorary Consultant Anaesthetist, Dr Ramai Santhirapala, to be relieved from clinical duties so she could speak with the group about the international Choosing Wisely campaign. We’re grateful for Ramai’s input and the team who relieved her from her operating list during this session. We enjoyed the thought provoking discussion around shared decision making and identified how this fits with the ‘improving culture and communication’ driver which the group collectively identified as a key area for improvement. During the fast-paced and inspiring team updates I was struck by the personal transformation described by Simon Mars, Consultant Ophthalmic Surgeon from Wrightington, Wigan and Leigh NHS Foundation Trust, who I first met at the initial theatre safety event last June. It was here that I encouraged Simon to attend a Human Factors Conference taking place in Manchester soon after. NHS Quest members received a free place and very often opportunities like this are taken up by non-clinical staff who’s diaries are easier to flex, enabling them to attend events where in fact the topic may be better suited to frontline staff. Debbie Sykes, a Clinical Risk Manager at Bradford Teaching Hospitals NHS Foundation Trust, shared how she had a ‘lightbulb moment’ on Friday. This is the first clinical community Debbie has participated in. She attended the first event last June and admitted feeling unsure about where this was going to go; how it might benefit those involved; or whether it was something she would commit to in the long term. Debbie shared how all the pieces of the puzzle had now fallen into place. The community had a clear, shared purpose, a measurement strategy that will demonstrate improvement over time and a large, multi-professional membership of enthusiastic experts who are actively sharing their learning so that everyone can benefit. I felt Debbie’s reflections truly affirmed the value-add of the clinical community, and it was encouraging to see her views echoed by her peers in the event evaluation. It’s no wonder that I left the day feeling optimistic about the community’s purpose and with an overwhelming sense of fulfillment. The community has built great momentum and we are already starting to see innovative ideas spread across the country in nine operating theatres. It’s a huge privilege to work with the teams who are committed to improving theatre safety and the experience of their staff. In the next phase the group have decided to develop a tool to measure culture in NHS Quest theatres to demonstrate impact on one of our more tricky primary drivers; to share action plans from Serious Untoward Incidents (SUIs), Near Misses and Surgical Never Events so these can be thematically analysed and learning outcomes shared, and members will be providing data for Laura, our Data Analyst, to input into the bespoke measurement dashboard. There was a sense of excited anticipation for the next meeting at Royal United Hospital Bath in June… there’s a lot do before then! Today was one of my best work days ever. Thank you @NHSQuest #TheatreSafety #clinicalcommunity & @SarahSnape90 @loarj for being amazing!